Paper Narratives is a group invitational exhibition curated by Abecedarian Gallery director Alicia Bailey. Although the work shares the common denominator of having paper as a primary material, the exhibition is intentionally diverse. Narrative indicates a story of some sort, and is generally used in the context of either a written or spoken account. Narrative as a conceptual device in visual work has as long a history as visual work itself, coming in and out of fashion as art ‘isms’ often do. 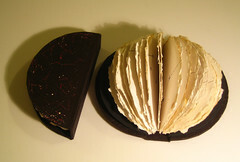 As is Bailey’s curatorial preference is to include work by students/emerging artists, work by artists well established in their field and regions but under-exhibited in Denver and artists working in the Denver Metro area. 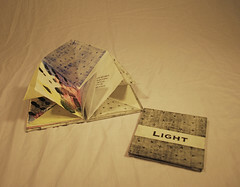 Abecedarian Gallery has a focus on book arts; this exhibition includes work by ten artists working in the book form. 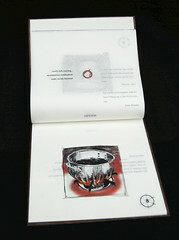 such as Andrew Huot‘s distillation of everyday situations into printed books bound using traditionally bound structures. 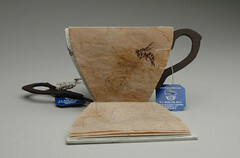 Kelly Nelson’s Black Not Boiled is a small tea-cup shaped book, printed on handmade and teabag paper based on her mother’s writings about tea. 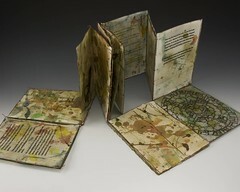 Alicia Griswold, a skilled writer works from the premise that everything, the whole universe, can be found in a garden. Zina Castanuela‘s oversize sculptural book Josephine uses the contrast of handmade paper from different plant fibers to tell a story about her grandmother. 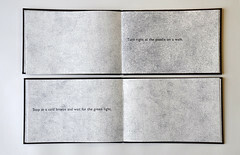 Harold Lohner creates accordian books in which a series of related images, drawn from a collection of anonymous photos, are presented in a nonverbal narrative. As the narrative is not explicitly detailed, the bits of imagery and found text engage the viewer in assembling a story. Sun Young Kang‘s books hint at universal experience through reflection of the personal, such as her Story of Thousands of Stars which tells a story combining the happiness and joy of meeting with the inevitable sorrow of farewell. 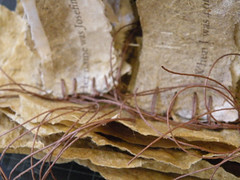 Mary Ellen Long creates work that tells the story of the environments affect on materials. 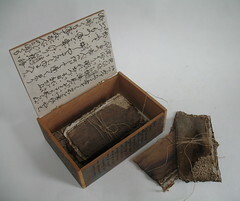 The stories are subtle and partially hidden inside rolled scrolls. While personal narrative is often engaging and compelling, Bailey is here exercising her preference for work that transcends the personal yet stems from personal experience. 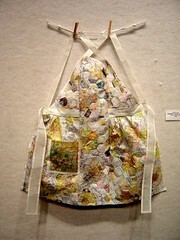 Linking familiar tales to personal experience is one way this is achieved such as in the work of Brenda Jones, who creates aprons and garments from manipulated and stitched paper, using imagery familiar to all of us but chosen based on personal experiences. 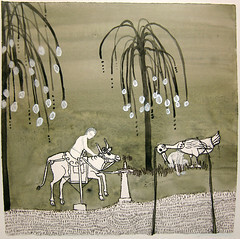 The pieces present generally familiar stories of a sort that remind viewers of stories in their own lives. Another artist very aware of the power of stories to link all that is personal to something more universal is Carrie Scanga, whose etchings invite viewers to engage both their memory and imaginations. 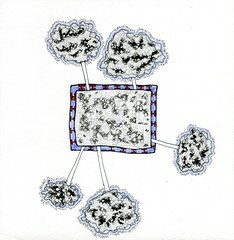 Brandon Sanderson bases his prints on the interaction of mechanical and organic parts within himself and in the world around him. 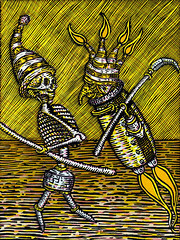 He has created characters that are collages of personal symbolism, art historical imagery and mechanical metaphor. 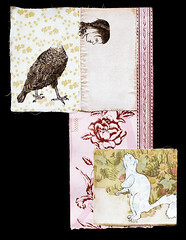 Less invested in personal narrative are the works of Lauren Scanlon who retells stories found in common social narratives such as fairy tales and romance novels by piecing them together again in collages of paper, fabric and thread. A diaristic approach is one Karina Cutler-Lake employs as she organizes and packages everyday experiences into mixed-media paper panels. Jen Urso is another artist dilineating minute by minute experiences, but she is using created experiences governed by pre-determined actions, such as walking a specific path in an area not perceived as particularly beautiful or noteworthy. Sequencing and repitition are workable means of presenting narrative employed by artists creating wall works. 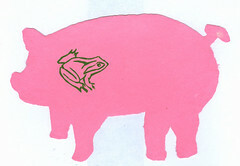 Andrea Peterson‘s Pig series is a 51 pig installation of bright pink handmade paper pigs, each printed with a symbol that shows how almost everything can be traced back through the stomach of a pig. The installation is accompanied by wood-fired ceramic pics made by Andrea’s husband Jon Hook. Working entirely outside the parameters of personal narrative are Lauren McCleary who uses the absence of humanity in her quietly elegant paper cutouts to tell tales of the world’s wonder. 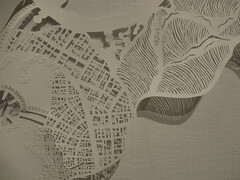 Also in the exhibit are woven paper pieces by M. Beneventi. 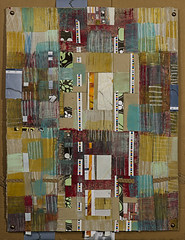 This entry was posted in 2009 Exhibitions and tagged abecedarian, andrew huot, Harold Lohner, Kelly Nelson, Lynn Sures, Sun Young Kang.